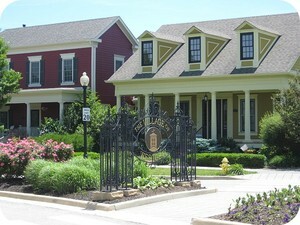 The Carmel Indiana neighborhood of Village of West Clay is a modern twist on the old-fashioned concept of community. Architecture reminiscent of the mid-1800s with welcoming front porches and antique-style street lamps all lend to the vintage feel of the neighborhood, which includes luxury townhomes, cottages, and executive homes. Combine great architecture with equally appealing specialty shops, restaurants, and businesses all within easy walking distance, plus pools and parks and walking paths, and it´s easy to understand why this example of New Urbanism is considered one of the best of the Midwest. Homes range from the mid-$200s for a charming cottage on the promenade to more than $2 million for an 11,000 square foot mansion on a pond with an 18x22 foot dining room! Listing courtesy of Brenwick Realty Co. Llc.